Were you still stressed….while you were sleeping? Depression, stress and anxiety constitute spectrum of the same neurological disorder which is characterized by general feeling of low mood, displeasure and low self-worth. Despite of high prevalence of these conditions, due attention is not paid to them. In order to make early recognition easy, some simple parameters should be identified so that further management can be done, if needed. Objectives: To measure and compare perceived depression, anxiety and stress among a sample of female boarding medical undergraduates in a private school (UCMD) in association with their TLC and sleeping pulse before and after the period of exam. Methods: The study was approved by ethical review board of University College of Medicine and Dentistry, The University of Lahore. A sample of 30 female medical students was taken after their consent and their level of depression, anxiety and stress was assessed using DASS 42, along with the measurement of their sleeping pulse and total leucocyte count, both under resting state and during time of stress. Results: Results showed increase in level of sleeping pulse and total leucocyte count during time of stress. Similarly, stress, anxiety and depression level was found to be significantly elevated during exams, which were the major stressor of students. Conclusion: Mind and body has linear effects over each other both during and after stressed, depressed and anxious state. Depression, anxiety and stress, nowadays, are quite common conditions with a prevalence of 60.8%, 64.3% and 62.4% respectively as identified in a study conducted in Egypt.1 Similar trends have been observed in other parts of the world too, for example, Franciscan University in United States showed a 231% increase in annual visits related to issues of mental health. This particularly holds true for college students who are facing innumerable mental health issues these days most notably being depression, anxiety and stress.1,2 Depression refers to a common mental disorder which is characterized by low mood and energy, loss of interest, disturbed appetite and sleep and lowered self-esteem.3 While depression is a well defined mental disorder, anxiety is defined as an apprehensive uneasiness of mind as a consequence of some anticipated trouble.4 On the other hand, stress refers to the reaction of a person to some challenging situation.4,5 Stress results in different body manifestations like irritability, lack of concentration, tension and a variety of physical conditions.5 All these three conditions are characterized by considerable impact on human mind. This qualitative study was conducted on a purposive sample of 30 female boarding medical undergraduate students, between the ages of 18-20 years. Study was carried out in on-campus boarding house. They were not suffering from any active infection. They signed the informed consent. They were residing in on-campus boarding house, so were easily accessible. Their level of depression, anxiety and stress was assessed using DASS 42, along with the measurement of their sleeping pulse and total leucocyte count, both under resting state and during time of stress. The sleeping pulse was recorded once the students were observed to be in deep, slow wave sleep and it was confirmed by lifting the upper eyelid and checking for absence of rapid eye movements. Total leucocyte count was determined with the help of haemocytometer due to non-availability of hemo-analyzer. 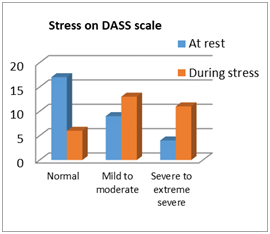 The study showed that depression, anxiety and stress on DASS-42 got significantly elevated during exams. 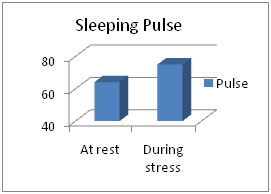 Similarly, sleeping pulse also showed a significant rise when it was measured just before the onset of exams. Total leucocyte count remained within normal range at both instances but was found significantly elevated before exam from that seen at rest (Figure 1–5) (Table 1). Figure 1 Depression level was significantly higher during exam (chi-square McNemar test: p value 0.003). Figure 2 Anxiety level was significantly higher during exam (chi-square McNemar test: p value 0.001). Figure 3 Stress level was significantly higher during exam (chi-square McNemar test: p value 0.001). Figure 4 Pulse rate increased significantly at the onset of exam than at rest (paired t test: p value <0.001). Figure 5 Total Leucocyte count increased significantly at the onset of exam than at rest (paired t test: p value <0.001). Major stressors identified in our study were health related like poor quality of food in the mess as highlighted by 86% of participants. Then, psychosocial factors like living away from home was psychosocial factors like living away from home were also blamed to be a reason of stress by 40% of participants. However, 23% participants held academic issues responsible for this anxiety and stress. Findings of our study go parallel to the studies conducted in other parts of the world. According to our study, pulse rate and total leucocyte count got significantly elevated during times of stress as supported by studies done in United States and other parts of the world.10,12,13 Similarly, level of anxiety, depression and stress also got elevated significantly whenever a stressor in the form of exam was faced by participants of our study. This elevation, as measured on DASS-42 suggested gross physiological changes as a consequence of psychological disturbance. Our study helped not only in identifying major stressors for undergraduate students but it also highlighted the link between body and mind. According to our study, they work parallel to each other and as a consequence, every stress faced by the mind is reflected through physiological changes by the body, most notably being the heart rate and leucocyte count. Mind and body has linear effects on each other both during and after stressed, depressed and anxious states. Depression, anxiety and stress, all rise significantly in response to a major stressor like exams. Sleeping pulse rate increases significantly from the state of rest to the onset of exams. 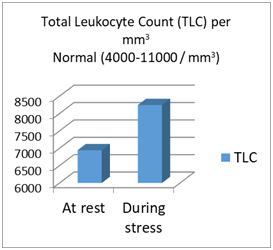 There is a significant increase in total leucocyte count at the onset of stress. Only female boarders were assessed due to unavailability of hostel for boys. Study sample was small, as most girls didn’t give consent to the participants to check into their rooms at night. We could not obtain similar data from day scholars due to lack of access while they were sleeping. The menstrual history of participants could not be taken into account due to certain limitations. Haemocytometer was used for total leucocyte count, due to non-availability of hemo-analyzer in the department. Complete menstrual history of female participants. Exclusion of all possible factors that can cause an increase in pulse rate. Abdul Wahed W, Hassan S. Prevalence and associated factors of stress, anxiety and depression among medical Fayoum University students. AJM. 2017;53(1):77–84. Beiter R., Nash R., McCrady M, et al. The prevalence and correlates of depression, anxiety and stress in a sample of college students. J Affect Disord. 2015;173:90–96. Cesar J, Chavoushi F. Background paper on depression. Priority medicines for Europe and the world. 2013. Dobson C. Effect of academic anxiety on the performance of students with and without learning disabilities and how students can cope with anxiety at school. 2012. Devi U. A study on stress management and coping strategies with reference to IT companies. Journal of Information Technology and Economic Development. 2011;2:30–48. Mutalik N, Moni S, Choudhari S. et al. Depression, anxiety and stress among college students in Bagalkot: A college based study. The International Journal of Indian Psychology. 2016;3:179–186. Khim Teh C, Ngo C, Zulkifi R., et al. Depression, anxiety and stress among undergraduate students: A cross-sectional study. Open Journal of Epidemiology. 2015;5:260–268. Jayanthi P, Thirunavukarasu M, Rajkumar R. Academic stress and depression among adolescents. Indian Pediatrics. 2015;52(3):217–219. Duivis H, Kupper N, Penninx B, et al. Depressive symptoms and white blood cell count in coronary heart disease patients: Prospective findings from the heart and soul study. Psychoneuroendocrinology. 2013;38(4):479–487. Kronfol Z. Immune dysregulation in major depression: a critical review of existing evidence. Int J Neuropsychopharmacol. 2002;5(4):333–343. Laake JP, Stahl D, Amiel S, et al. The association between depressive symptoms and systemic inflammation in people with type 2 diabetes: findings from south london diabetes study. Diabetes Care. 2014;37(8):2186–2192. Chamlems J, Quintana D, Anne-Abbott M, et al. Anxiety disorders are associated with decreased heart rate variability: a meta analysis. Front Psychiatry. 2014;5:1–11. Latvala A, Halkola R, Ruck C, et al. Association of resting heart rate and blood pressure in late adolescence with subsequent mental disorders: A longitudinal population study of more than 1 million men in Sweden. JAMA Psychiatry. 2016;73(12):1268–1275. 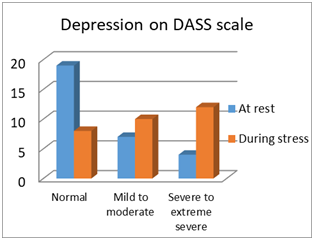 Tran DT, Tran T, Fisher J. Validation of depression, anxiety, stress scales (DASS) 21 as a screening instrument for depression and anxiety in a rural community based cohort of northern Veitnamese women. BMC Psychiatry. 2013;13:24. Nieuwenhuijsen K, de Boer A, Verbeek J, et al. 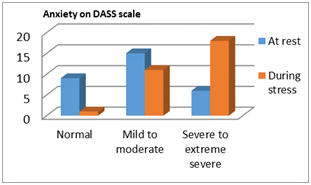 The depression, anxiety, stress scales (DASS): detecting anxiety disorder and depression in employees absent from work because of mental health problems. Occup Environ Med. 2003;60 Suppl 1:77–82. Wani M. Stress anxiety and depression among science and arts students. International Journal of Education and Psychological Research. 2016;5:48–52. Sarokhani D, Delpisheh A, Veisani Y, et al. Prevalence of depression among university students: A systematic review and meta-analysis study. Depress Res Treat. 2013:373857. Nishitani N, Sakakibara H. Association of psychological stress response of fatigue with white blood cell count in male daytime workers. Ind Health. 2014;52(6):531–534. ©2018 Ilyas et al. This is an open access article distributed under the terms of the Creative Commons Attribution License , which permits unrestricted use, distribution, and build upon your work non-commercially.